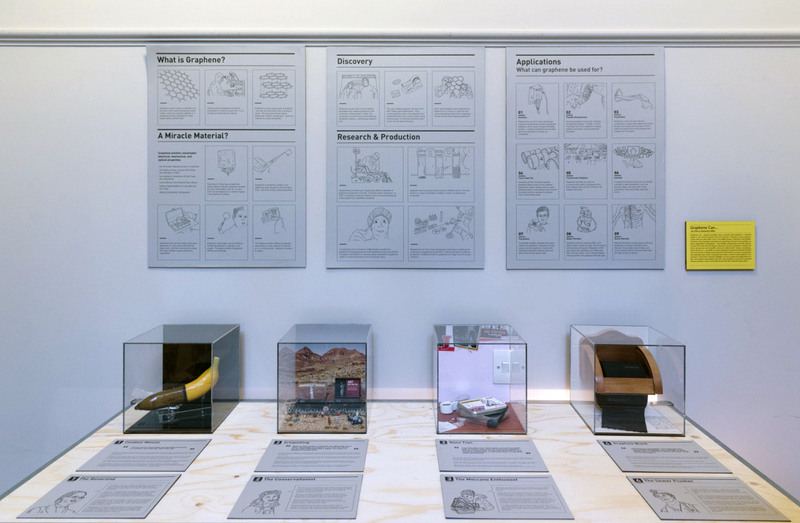 An exploration into possible future scenarios with graphene, a material hailed as ‘the miracle material of the 21st Century.’ Based around the use of a ‘salesman suitcase’ of graphene samples, as a tool to speak with people about how they envision their future with graphene. Graphene can… is a joint research project done with Samantha Miller. It is the final project we did on the MA Interaction Design course at Goldsmiths, University of London. After visiting several labs such as the National Physical Laboratory in Teddington, and the Department of Materials at Oxford. We wanted to speak with varied members of the public about graphene. As well as engage them with the material, its properties, and applications. 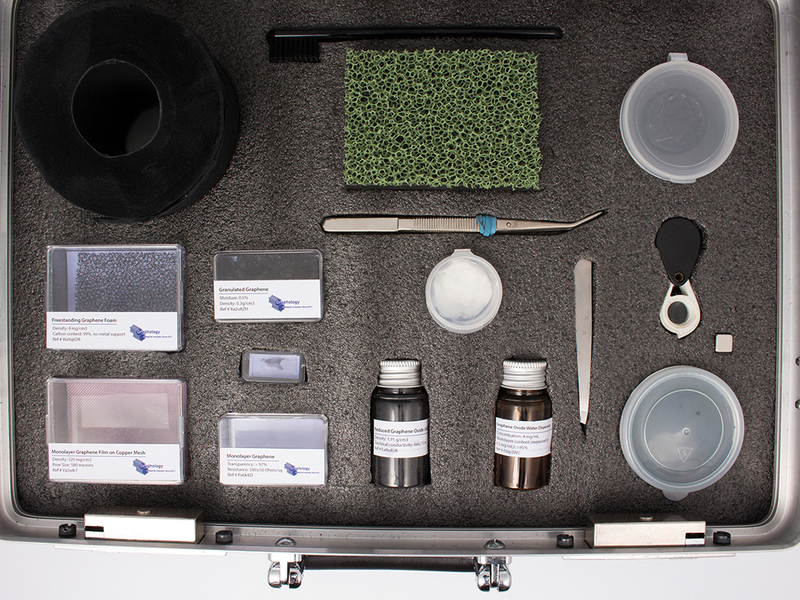 To do this we created the ‘salesman suitcase’ of graphene samples. Which included material samples in various forms (powder, dissolved in liquid). It contained an array of everyday objects, a toilet roll, sponge and condom to generate discussion around more common uses. Alongside the case we included a set of cards, used to discuss topics of interest, and to find out more about the people we were speaking to. We spoke with a diverse set of people around London with varied interests, hobbies, professions, and lifestyles. These included a tattoo artist, an art conservationist, a knitting enthusiast, a reverend, and a Meccano expert. Each provided us with a completely fresh take on how graphene may be used in the future, and what people want to use it for. Our conversations sit in contrast to the narratives heard from technology corporations. They promise futures of graphene with omnipresent touch-screens and flexible smartphones. The People we spoke to imagined everything from packaging material, to graffiti-resistant bus stops, to graphene toilet paper. Our aim was to engage with members of the public and both raise their awareness about graphene, and provoke them to explore what it might mean for their own future(s). From these conversations we designed four artefacts illustrating possible future scenarios with graphene. Our intention is that these scenarios highlight not only unexpected applications for this much-hyped nanomaterial, but also raise questions around the potential futures, behaviours, issues, and controversies that this material brings with it. - What might happen if graphene condoms are commonplace? - How might we use graphene toilet paper? - What ‘artspotters’ may emerge if art goes on the move on trains? - What new risks may ‘nano toys’ introduce to the world of play? The exhibit included information on graphene and its properties, potential future applications and the focus of current scientific research. In front of each designed artefact was a description of the imagined scenario, and a description of the ‘persona’ of the person with whom we spoke to. Graphene Can... was exhibited at Deptford Town Hall from December 9-11, 2014. A day-long symposium was held on December 11, where we presented our project and process to various academic and industry partners including members of Phillips Design, Plot Design, STBY, and Goldsmiths’ Interaction Research Studio.